Remember that time I told you we had 19.5 pounds of peaches sitting in a box on the countertop, softening and bruising and ripening with the frantic inevitability of a large snowball teetering atop a very steep hill? It started with a mosquito (apparently). This rogue mosquito (apparently) got past our fortress of insect security (and by “fortress of security” I mean “we sleep with the windows wide open”) and, a few short nights ago, found itself in our bedroom. Allegedly, said mosquito took a liking to Ben (can’t blame it there, I suppose), and started biting. And biting. With vengeance. Apparently. As far as I’m concerned, this bit about a mosquito may or may not be true. All I know is that I woke up at 3am to blinding light and furious swatting. Half-asleep and wholly confused, I made a cotton-mouthed and squinty-eyed attempt to see what was the matter before muttering something meant to sound like “ok” and sliding back to sleep. I woke up alone, the bedsheets next to me bunched, crinkled and cold. Interesting. Maybe Ben had woken up early and gone for a run? Overachiever. Maybe he’d bring me back a bagel? I walked down the hall to the bathroom, thinking about bagels. I opened the door and quickly learned that, no, Ben hadn’t gone for a run. He wasn’t bringing me back a bagel. There he was, scrunched on top of our extra roll-up mattress, which he’d wedged into our tiny bathroom. The mattress looked more like a hammock, the way it was squished between the wall and the bathtub, all lumpy and misshapen in the too-small space, but, apparently, it had to be done. To escape the mosquito. Obviously. On account of a definitively weird night’s sleep on account of that dastardly mosquito, we decided we needed to get out. Get some fresh air, leave this bizarre and droopy-eyed place. 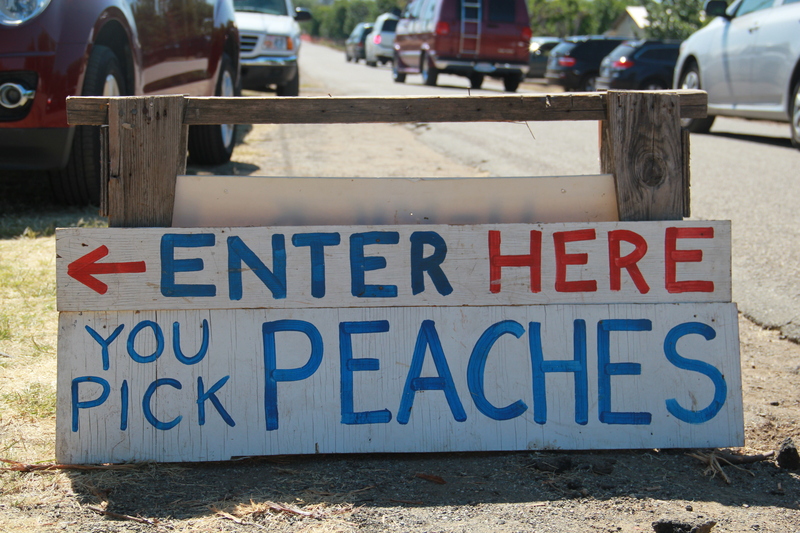 So we hopped in the car and drove two hours, to the peaches. 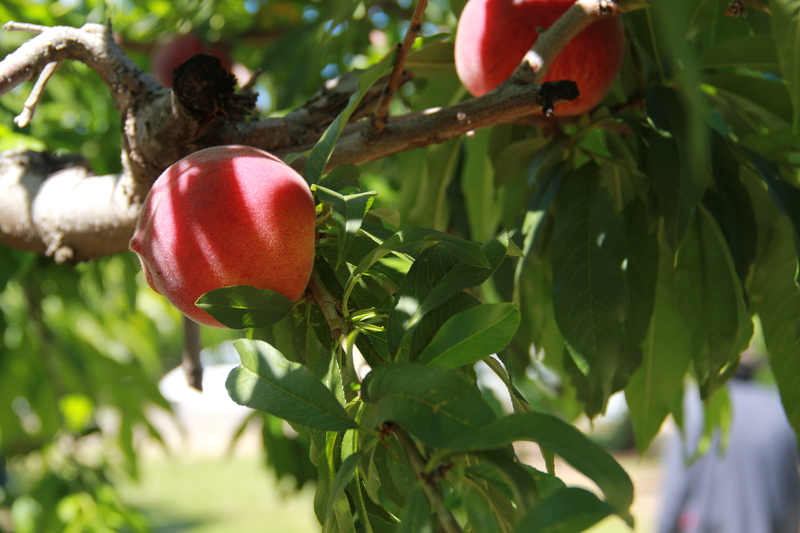 And there were so many peaches! All thoughts of mosquitos and tiredness vanished as we filled our bucket with fuzzy, pink-cheeked fruit, their intoxicatingly sweet smell enrobing us in summer. We got carried away. To the tune of 19.5 pounds, as I believe I have already mentioned. 19.5 pounds is quite a lot of peaches, you should know. 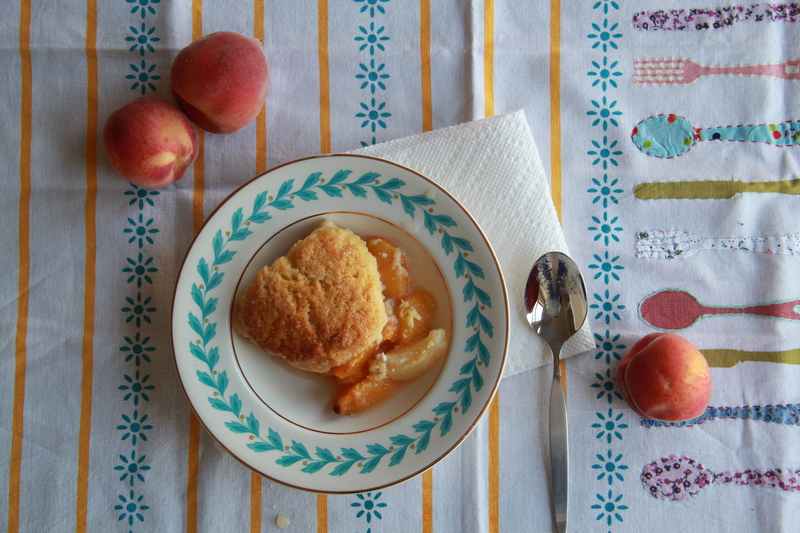 It’s enough to have two whole peaches cut into your morning cereal for two weeks, plus 10 jars of freezer jam, countless fresh snacks eaten, dripping with juice, over the kitchen sink, and one very spectacular cobbler, topped with faintly sweet and satisfyingly crunchy cornmeal biscuits. You’ll want to know about that last one, I imagine. Here she is – thanks (allegedly) to that pesky mosquito. Preheat the oven to 375 degrees F. Place a 9-inch pie dish on top of a parchment lined, rimmed baking sheet or jelly roll pan. Gently toss peaches and sugar together in a large bowl and let sit for 5 minutes — the peaches will release some juices and become syrupy. Drain peaches in a colander over a bowl and reserve 1/4 cup of the juice (you can throw out any remaining juice). In a small bowl or measuring cup, whisk together the reserved peach juice, lemon juice, cornstarch, salt and cinnamon until smooth. 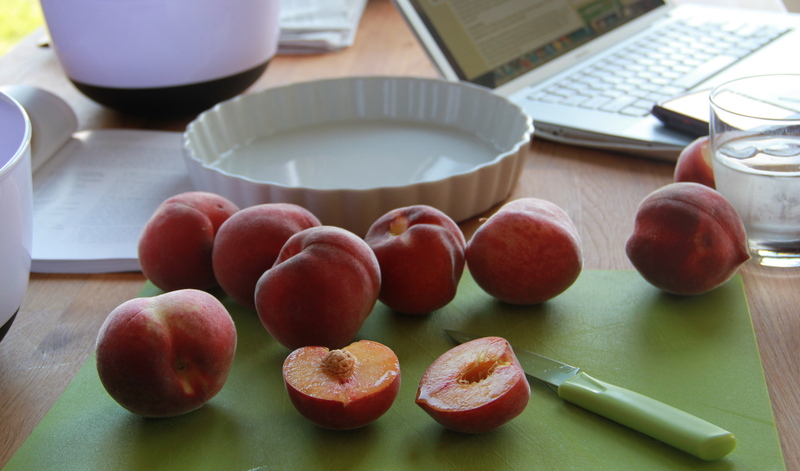 Mix peaches and juice mixture together in a bowl, and then transfer to the prepared baking dish. To make the biscuit topping, whisk together the flour, cornmeal, sugar, baking powder and salt in a medium bowl. Add the cold, cubed butter and use your fingertips to rub the butter into the dry ingredients, working quickly, until the butter pieces are well incorporated and no larger than lentils. Add the heavy cream and use a rubber spatula to gently stir until the dough comes together, with no dry bits on the bottom of the bowl. Do not overwork the dough. Use a large spoon or ice cream scoop to divide the dough into 8 rounds, placing them atop the peaches in a circle and leaving a bit of room between each round (the dough will expand in the oven). Brush the tops of each biscuit with some heavy cream, and generously sprinkle with turbinado sugar. 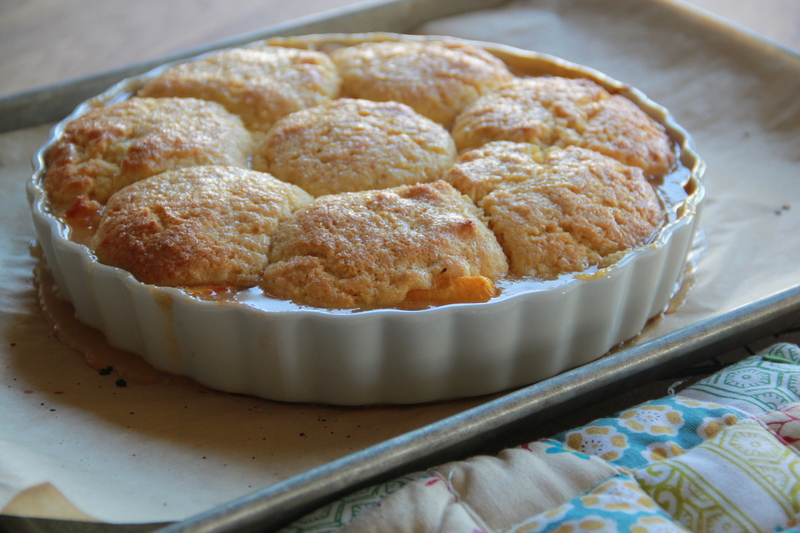 Bake the cobbler for about 35 minutes, until the filling is bubbly and the biscuits are deeply golden brown. Allow to cool slightly before serving warm, with a splash of cream or maybe a scoop of vanilla ice cream on top. This looks like the most delicious recipe you have posted in a very long time. Make it for me, please? Birthday cobbler? Molls, you know how I feel about cobblers. This one will be tested immediately! 1 tsp of salt was too much for the peach layer. If I make this again, I’ll reduce the salt to a half-teaspoon or less. Thanks for the comment, Victoria! I use kosher salt, which tastes less salty than other kinds, so I can see how using 1 tsp table salt or sea salt might be too much. Will change the recipe now to specify kosher salt. Thanks again! I just made this with my little girl and the whole family loved it! Thanks! Yay! This makes me happy. Thanks Jessica! Is there a way of printing older recipes from your site besides cut n paste? I didn’t see the Print option. Am I missing something?? can you substitute for the cornmeal? my wife doesn’t like the grittiness of cornmeal. looks delish!! I haven’t tried, but I imagine you can substitute all purpose flour for the cornmeal if you’re so inclined. Let me know how it goes! I’ve been meaning to thank you for this wonderful recipe Molly! I’ve made this cobbler for the last two Christmases, and my family absolutely love it! 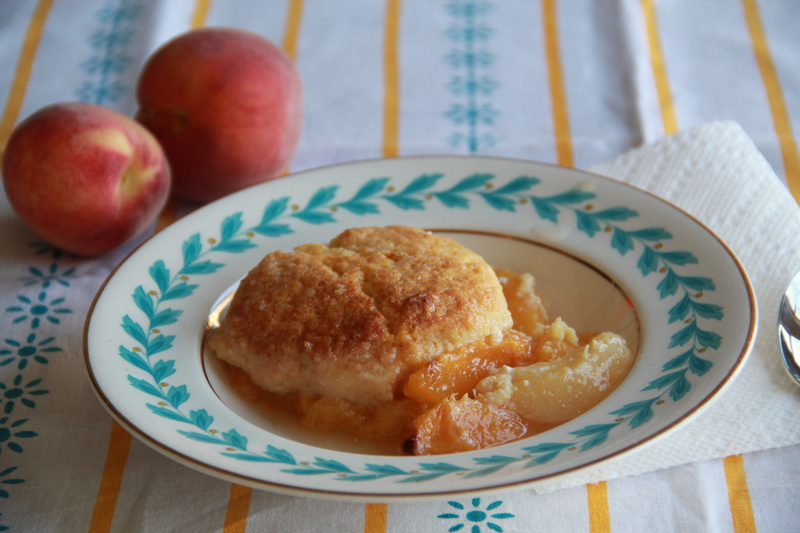 It’s become ‘Mish’s peach cobbler’ – although I tell everyone that I found it on your blog, and a must have for Xmas dessert. I’ve doubled it and tripled it, and it’s always been so delicious, thanks so much to you… and that pesky mosquito!